A room at the Hotel Hive. Courtesy Abdo Development. Forget the minibar, armchair, and executive desk. 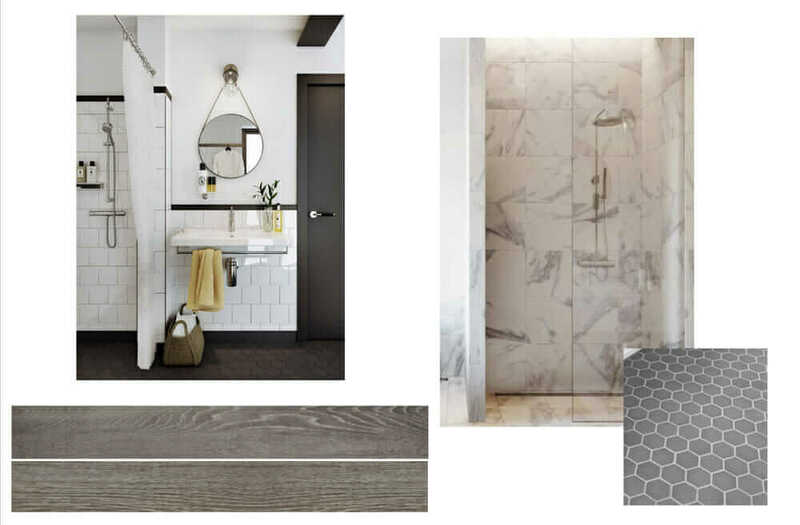 A typical one- or two-person room in the new Hotel Hive in Washington, DC, has space for a bed, a side table, and a small bathroom—and that’s pretty much it. 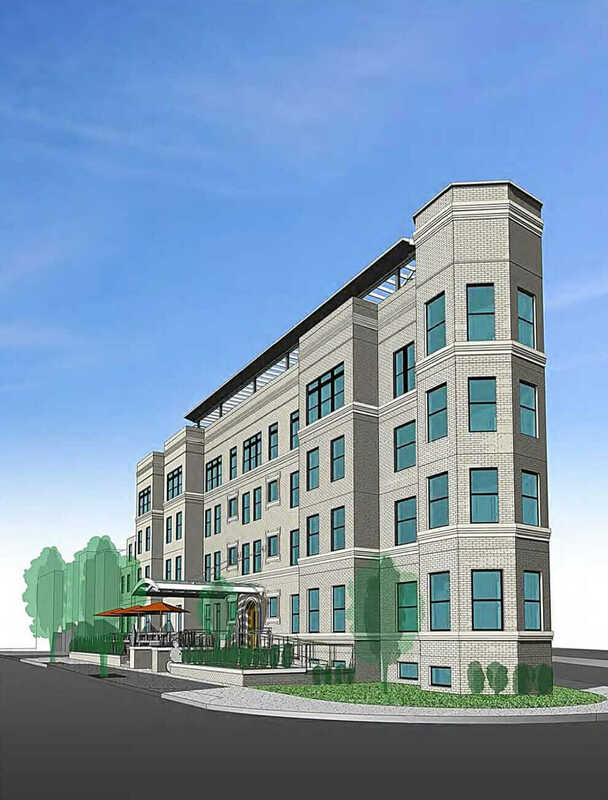 The hotel, due to open this summer, is part of a new generation of hotels that is less about suites and kitchenettes and more about efficiency, connectivity, and affordability. These so-called microhotels, or pod hotels, offer tiny rooms meant to attract working travelers on a budget or those who’d prefer to hang in a hip public space than hole up in a banal hotel room. Hotel Hive exterior. Courtesy Abdo Development. Travelers can now stay in pod-style hotels in New York City, San Francisco, Tokyo, and other places where space is at a premium. Marriott, the behemoth hotel chain, has even gotten into the act with its Moxy microhotels. The company has a dozen new properties opening worldwide during the next year, including ones in New Orleans and Nashville. The hotels follow the no-frills, downsizing trend of recent years: tourists who take BoltBus on the cheap; the “tiny house movement,” which has spawned a number of cable TV shows; Smart cars that fit into half a parking space; and so on. It also addresses modern consumers’ desire for a more localized experience—emphasizing local food and local color—that brings travelers into a distinct urban scene while eschewing tired hotel staples like mass-market paintings of country scenes on the walls. 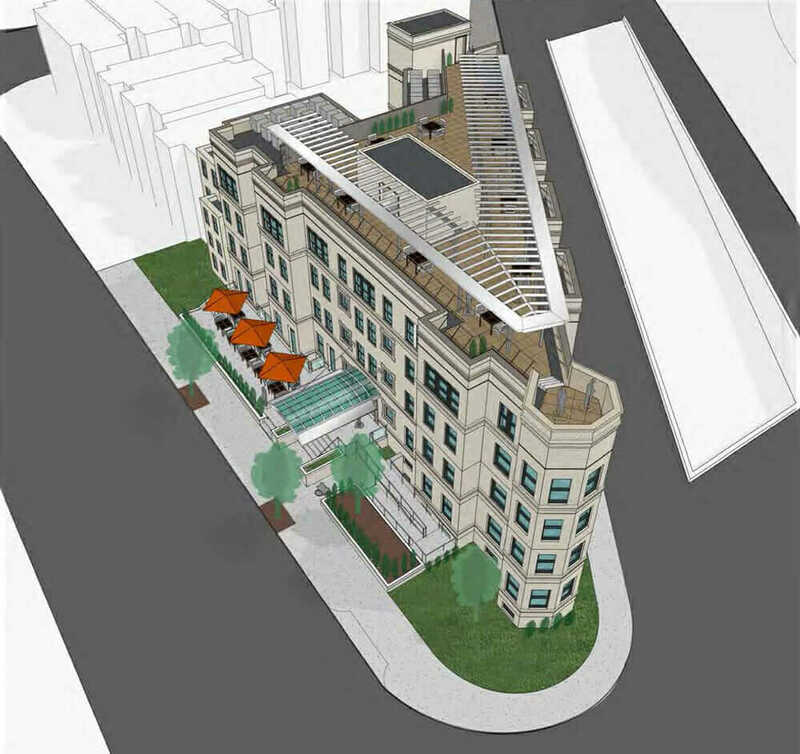 Aerial-view rendering of Hotel Hive. Courtesy Abdo Development. Hotel Hive is the first of several microhotels now under construction in the nation’s capital, adding to a thriving hotel industry that caters to the city’s 20 million visitors each year. 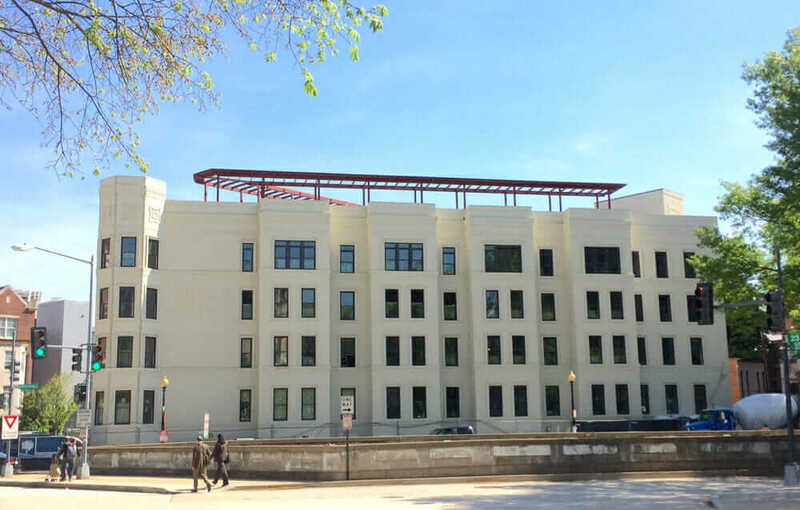 The hotel is a renovation of the historic but derelict Allen Lee Hotel in the city’s Foggy Bottom neighborhood, located not far from the Lincoln Memorial and the Kennedy Center. When Abdo Development purchased the five-story property, which is thought to date to the turn of the 20th century, it was known mostly for its horrible online reviews: “Worst Ever Hotel in the United States and Even in the Milky Way,” captioned one typical jibe. Given the building’s location in a historic district, Abdo was limited in the number of exterior modifications it could make. But the development team added an outdoor dining patio, an ADA accessible ramp, and a rooftop deck and trellis. And Abdo significantly rehabilitated the façade, including new windows, doors, masonry work, paint, and a new roof. Meanwhile, internally, a new fire staircase was added on one end. And the hexagonal shape will be used to full advantage: On the main level, it will be outfitted with a special booth with a VIP feel; on upper levels, the space allows for an unusual room on each level offering coveted and nearly 360-degree views of the surrounding city. As for the small rooms, they do require special compensations. All rooms will have private bathrooms, but they rely on things like pocket doors and upright showers to save space, mini-split HVAC systems, and furniture that doubles as storage. Every room has a TV (and fast Wi-Fi, considering everyone arrives with their own devices these days), and rooms with bunk beds have a TV on each bunk. Guest-room bath finishes at Hotel Hive. Courtesy Abdo Development. To maximize soundproofing, rooms are highly insulated and lined with both drywall and a second, engineered drywall paneling called QuietRock, which is made of gypsum and sound-absorbing polymers. Room entrances will be encrypted and can be keyed to an app on guests’ smartphones if they’d rather not deal with checking in at the front desk or keeping track of plastic key cards. At the same time, the hotel offers flexibility for older travelers and families: Some rooms have interior doors that could be opened to make an adjoining suite. Parents coming to visit their college-age kids at nearby George Washington University, for example, would be comfortable there, too. “We’re all about providing guests with convenience and value so they can get on with what they really want to do while they’re in town: socializing, sightseeing, visiting family and friends,” Ullom says. Architect Ludwig Mies van der Rohe famously said that less is more. With Hotel Hive and other microhotels nearing completion in DC and many other cities, it remains to be seen if this holds true for the next generation of travelers.